Virgin America Is Now Selling Tickets! Update: All Virgin Tickets Are Fully Refundable Until 08/08! The nation’s newest Jetblue copycat (LCC with high-tech, leather seats, and good customer service) is now selling tickets! -They will begin service between NYC/JFK and S. Francisco on August 8, with 4 flights a day offered on that route by September 9. -S. Francisco to Los Angeles begins August 8 with 5 daily flights. -JFK to Los Angeles service begins August 29, with 3 flights offered on that route by September 16. -Los Angeles to Washington DC/IAD begins on October 24 with two daily flights. -Vegas and intra-California flights start at $44+ each way in coach and $149+ in first. -Washington DC fares start from $129+ each way in coach and $389+ in first. -New York fares start from $139+ each way in coach and $389+ in first. Sign up by 12/31/07 to become a “founding member for life,” and you receive better benefits and rewards for life! It will be a spending based reward system, instead of a true mileage/points program. Earn 5 points for every $1 you spend for travel on Virgin America. Redeem a free trip starting at 4,900 points. Expect about 10 cities served within 1 year and 30 within 5 years. S. Diego service is coming soon. Atlanta, Austin, Baltimore, Boston, Charlotte, Chicago, Cincinnati, Cleveland, Dallas, Denver, Detroit, Fort Lauderdale, Fort Myers, Hartford, Houston, Indianapolis, Jacksonville, Kansas City, Miami, Milwaukee, Minneapolis, Nashville, Newark, New Orleans, Orlando, Philadelphia, Phoenix, Pittsburgh, Providence, Portland, OR., Raleigh-Durham, Sacramento, Salt Lake City, S. Antonio, S. Jose, CA., Seattle, S. Louis, Tampa and West Palm Beach. Coach class has custom-designed leather seats, mood-lighting throughout the cabin, and an advanced in-flight entertainment system with on-demand movies, TV, games, music, and online chat rooms to chat with specific or all fellow passengers. In First Class, massage chairs offer 55 inches of seat pitch and 165-degree recline. TAM Releases List Of 176 People On Board Doomed Flight 3054 From Porto Alegre-Sao Paulo. Update 2-11:00AM-CNN has just published the list in English. Update: According to the Brazilian news article below, at 9AM today TAM announced that there were 186 people on board. I don’t normally post these stories, but I still haven’t seen a list of passenger names on any of the English language news sites, so here is a list of the 176 passengers from a Brazilian news site. At least 15 more people on the ground were killed. I have personally flown out of Sao Paulo’s domestic airport, Congonhas, on multiple occasions. AA announced that you can now confirm a seat for $25 for a same day travel flight change within 12 hours of your desired flight. Previously you had to do it within 3 hours of your desired flight. This change will make it much easier to confirm a change to switch to a flight later than your original flight, rather than be limited to changing to an earlier flight becuase of the 3 hour rule. The best thing about confirmed standby is that it works even on mileage and priceline tickets, which normally do not allow standby at all! Here’s hoping that other airlines will match this customer-friendly policy change! -Only available for domestic/caribbean flights. -No changes are allowed in origin/destination airports. -Changes to the connecting airports are allowed. -Changing from an itinerary with a stop to nonstop or vice versa is allowed! Larry Kellner, CEO of Continental, has already promised that when they get their first 787’s it will fly from Newark-Tel Aviv, which is currently Continental’s most profitable route! According to Boeing, the 787 has been the most successful commercial airplane launch in history! -The 787 will be made of 80% composite material, allowing for 20% higher fuel efficiency, and allowing for a cabin with much higher humidity, so that travelers will get less dehydrated. -“Significantly increased comfort” due to the aircraft pressurization to the equivalent of 6000 feet altitude instead of the 8000 feet on conventional aircraft. -More spacious and technologically advanced bathrooms. -Larger windows with a higher eye level in order to see the horizon. -LCD auto-dimming instead of window shades. -3 color LED cabin lighting, allowing the aircraft to be bulbless. -Noise reducing technologies makes it quieter on the inside and outside. -Active Gust Alleviation system for a less bumpy ride. I wrote a roundup on Skybus last month when they started selling tickets starting at just $10. “Thank you for contacting Skybus. Finally, now that Skybus has started service, does anyone still doubt that “a la carte” airline pricing is inevitable? 19th Annual Freddie Awards Results! The Freddies are considered the ultimate bragging(and advertising) rights for frequent flyer programs. They were given out a few days ago in the Crystal Gateway Marriott in Arlington, Virginia. They are voted on by 448,000 frequent flyers! Here are some selected 2007 USA results, with my commentary following. Comment: If you only want to use your rewards domestically then this is true, but otherwise stick with AA, Cathay Pacific, or Continental. Comment: They got this one right! Comment: I’m not very familiar with the program, but from a quick reading of the benefits and what people say about them it seems like a pretty sweet program. Disclaimer: I currently have elite status on AA(Gold), Airtran(Lifetime), Continental(Silver), and Starwood(Gold). The Backwards Future Of Air Travel??? Can you imagine having to stare at someone 2 feet away from you for an entire flight? 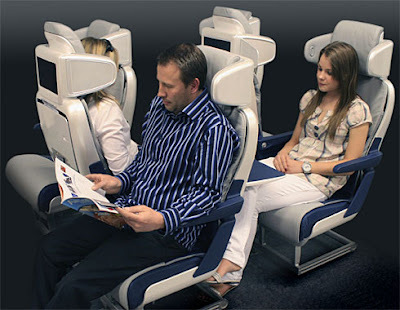 This has to be worst idea since the Airbus “standing room seats” idea of last year. BOILING HOT!!! SKYBUS AIRLINES INAUGURATES NEW SERVICE! TICKETS TO START AT JUST $10!!!!!!!!! Skybus is aiming to become the Ryanair of the USA. They will be totally no-frills, everything that can be charged for, will be charged for. Every single Skybus flight has just 10 seats on it for $10, so don’t hesitate to buy a ticket-what do have to lose??? Their hub will be Columbus, OH. You can fly for $10 to/from such cities as Los Angeles(Burbank, CA), Oakland CA, Seattle, and Ft. Lauderdale. -With over $230 Million, no airline has ever launched with more startup capital, the previous record was Jetblue’s $130 Million. -Skybus currently has 8 Airbus A319’s, and has orders for 57 more! -Each plane has jsut over 150, all leather seats. -Want to advertise? For just $500,000 a year you can plaster your name across the entire body of a Skybus plane! -Columbus, OH has given Skybus incentives worth tens of millions of dollars for the hub. -With a huge Columbus hub promised to be developed, Ohio will now have 3 cities with major hubs, Continental in Cleveland, Delta in Cincinnati, and Skybus in Columbus. Correct me if I’m wrong, but I believe it is now the only state to have 3 separate cities with hub airports. -The gist of their policies is that all you are buying is your airfare, anything else is additional. -The first 2 checked bags are $5 each, so it’s less than what Spirit charges. -All tickets go to Columbus, OH. so if you want to go from Burbank to Ft. Lauderdale you will have to buy 1 ticket from Burbank to Columbus, and 1 from Columbus to Ft. Lauderdale. -All seats are first-come, first served, however for $10 per flight you can purchase priority boarding. It is recommended to buy the priority boarding when you buy your ticket as there is only a limited amount of them sold on each flight. -To keep costs down, all communication is currently only available by email, there is no public phone number! -Changes to flights are $40+change in fare. -They say that food and beverages will be for sale-so you can’t bring your own, Do you guys think that they will really enforce that? I will continue to post more information on Skybus, so keep checking back! Northwest Gets Rid Of Free Standby! Effective April 24, Northwest Airlines will no longer offer the ability to standby for a same day flight for free. Confirmed standby allows you to change your flight, on the day of departure, to any other flight departing the same day for $25 if seats are available. The only difference is that NWA will require you to pay $25, whereas AA, Continental, Delta, And United all allow you to standby for free for a same day flight if you dont want to pay $25 for confirmed standby. You are currently browsing the archives for the Airline News category.